Camouflage is the pattern of the people: both deer-hunters in rural West Virginia and beard-moisturizers in urban California have an affinity for wearing the utilitarian-designed jackets, pants, and shirts as fashion items. Camo also has a loyal audience in rap: many a ’90s music video and CD cover featured the print, and search on Genius for “camo” in lyrics yields over 120,000 results, not a few of which were rap lyrics. A theory for the origins of camo in the hip-hop community: it was relatively high-quality cold weather attire available for low prices at surplus stores. At some point someone noticed that, Hey, the stuff looks dope, particularly in a size larger, and it spread from there. Thus, this list of camouflage moments skews heavily towards New York City and the South—in Los Angeles, “cold” weather rarely necessitates anything heavier than a sweatshirt. Buckshot has always been a bit of a hustler. As a teen, he’d make money by selling bootleg fragrances and books out of his trusty backpack. 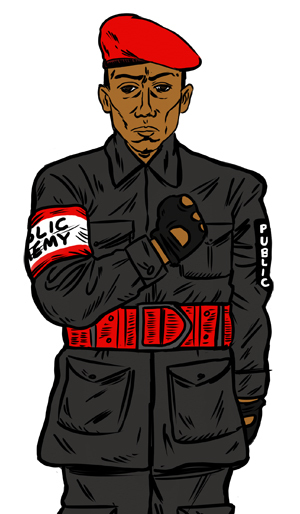 Given the opportunity to be an intern at S.O.U.L./MCA Records, he dropped out of high school. 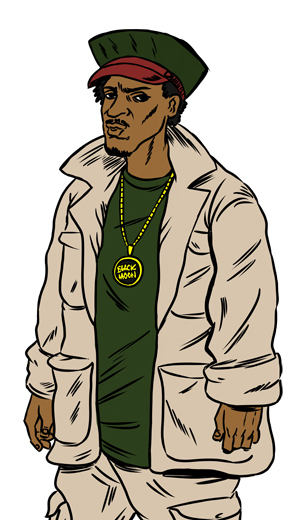 When Black Moon’s Enta Da Stage was released, the precocious Brooklynite was still a month shy of his 19th birthday; in addition to being the lead rapper in the group, he, alongside Dru Ha, was also managing Smif-N-Wessun, and trying to get Duck Down Records off the ground. 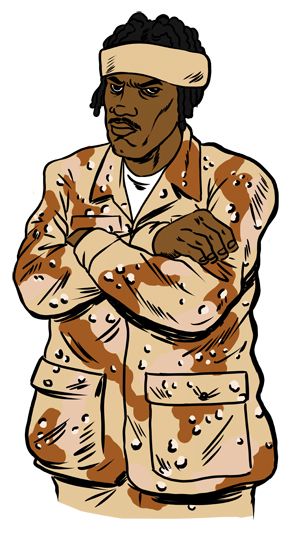 Logically, the video for “Buck ‘Em Down” has Buckshot as a silver-tongued military leader, he and his charges in shades of camouflage and olive drab. Like the aforementioned “Buck ‘Em Down,” the video for Smif-N-Wessun’s “Wrekonize” featured a remix rather than the original. While the original flips New York Port Authority and The Emotions to menacing effect, the remix, which samples Grover Washington Jr. and Bill Withers’ “Just the Two of Us,” has a softer, cheerier sound. 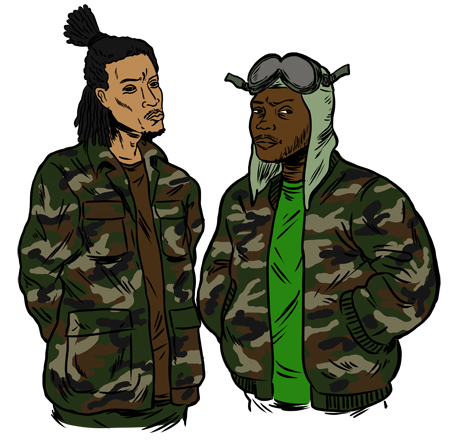 Tek and Steele’s matching camouflage outfits in the “Wrekonize” video belie the staid lyrics of the remix–the original doesn’t nearly preach the same sun-kissed unity. As their name would imply, Boot Camp Clik–the conglomeration of Buckshot, Smif-N-Wessun, Heltah Skeltah, and O.G.C.–were a rather militant bunch. Three of the supergroup’s four album covers were military-themed (Oddly, the fourth had them in 70’s basketball gear), and it seems that almost every video the members released in the ’90s, the above included, featured at least one man in camo. The War Report wasn’t just the name of Capone-N-Noreaga’s debut–they were both really about that life, so to speak. The duo, who met in prison on unrelated attempted murder charges, had trouble releasing the album because during its recording Capone was again imprisoned for a parole violation; Noreaga was forced to find rappers to fill in for his incarcerated partner. (Tragedy Khadafi features on eight songs, and Havoc of Mobb Deep another three.) Though he was present for the production stage of their sophomore effort, 2000’s The Reunion, Capone was–deep breath, repeat after me–again imprisoned for violating his probation, and was unavailable to promote the album. The Reunion received lukewarm reviews, and CNN’s own reunion was short-lived. In 1992, a 15 year-old Juvenile made one of bounce music’s seminal tracks, “Bounce (for the Juvenile)”. Three years later, he released his debut, Being Myself, which garnered little attention. Five years later, he was working a somewhat lucrative, if extremely dangerous, asbestos-removal job. A chance encounter with Mannie Fresh and Baby landed him on Cash Money Records, where he released Solja Rags, so named for his prefered bandana pattern: camouflage. The album was a regional hit, and much of its lead single, the aptly-titled “Solja Rag,” would be reused for “Ha,” arguably the greatest New Orleans rap song ever. 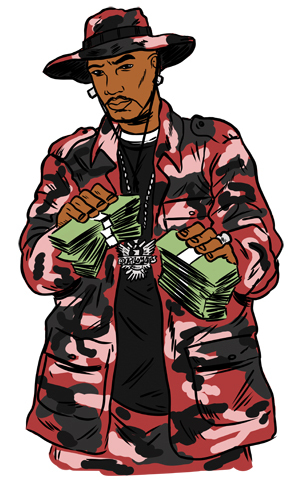 Cash Money’s success made them countless enemies, most notably No Limit Records, who, capitalizing on Big Boy Records’ collapse, became their biggest rivals. 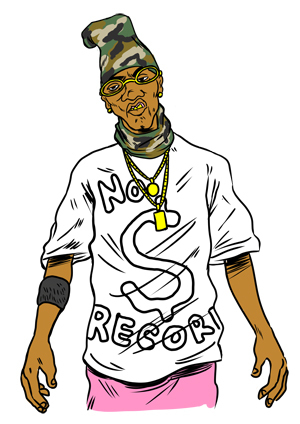 Rumor has it that Da Wild Boyz, fronted by Sporty T, were No Limit artists under different pseudonyms, and that “Drop That Solja Rag” was a piece of shadow warfare conducted by Master P.
Nostalgia for The Diplomats is, at its heart, nostalgia for a bygone New York City that produced eccentric Harlemites in natty pink duds. Their music was sometimes good, occasionally great, but mostly uneven. Their style was nearly unimpeachable. 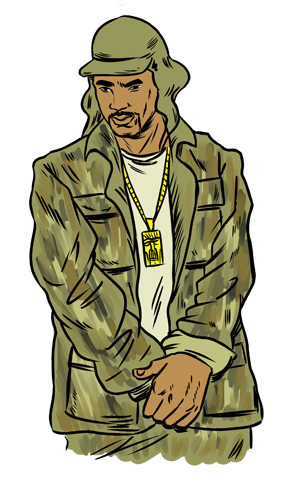 Cam’ron’s attire in the “Get ‘Em Girls” video–pink, black, and red camouflage from ankle to bucket hat–would only have utility in a dark meat locker, but fashion over function is often the equation in rap style. 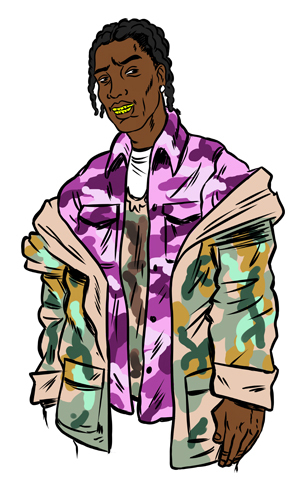 It makes sense that A$AP Mob, other Harlemites whose biggest star is a Southern rap obsessive, would don the technicolor camouflage. (Unintentionally, they look like the alliance of suburban gangs in Ali G Indahouse, Britain’s greatest contribution to film.) The hallucinogenic pixelation of the “Yamborghini High” video is accentuated by the Mob’s kaleidoscopic camo. Where uneven tears between scenes begin and end is complicated by their garb’s multi-layered coloration. In this video, A$AP Mob are better equipped for an afternoon with the Merry Pranksters than they are for wartime.